"Password security policies and best practices"
With password security policies and best practices in constant flux, our effectiveness in safeguarding our organization requires scrutiny. Unfortunately, the regulatory bodies we must abide by do not always pave a clear direction. This is where our own judgment must fill in the gaps. When it comes to password security policy, it is always a good rule of thumb to take a segmented approach over a generalized one. 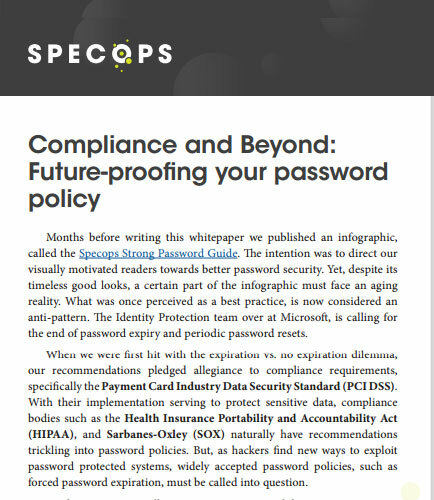 This whitepaper provides insights on how to create a strategy for password policies, while continuing to meet today’s compliance requirements. What are Pci Dss Standards and their requirements? The Payment Card Industry Data Security Standards (PCIDSS) is a set of comprehensive requirements for enhancing payment account data security and forms industry best practice for any entity that stores, processes and transmits cardholder data. Is the payment card data security is worrying your business? The intent of this whitepaper is to help you understand the PCI DSS standards and to apply it to your payment card industry transaction environment. It highlights: The PCI data security standards: A mandate for cardholder security Security testing for PCI validation and compliance in payment card industry Fulfill the Penetration Testing Requirement and more Read this whitepaper which explains the importance of PCI Dss standards and how they can be easily attainable by all organization to get rid of the complexity that the organizations face to protect the card hard holder data and the 12 key requirements to be followed for the PCI compliance for your organization. What is Data Governance ? Data Governance may not be a buzzing word in the technology landscape, but surely it has been terribly impactful in the data-driven business world. Data governance is the process of implementing a standard set of rules for managing an organizations valuable asset called ‘data’ in order to make better business decisions.